Learn more about yourself and those around you by reviving the art of good old fashioned discussion. Filled with 100 prompts, this book is designed to be one part conversation guide and one part journal. The inside pages dedicated to the prompts are created with plenty of unlined space where you can write, sketch or doodle your answers as you see fit. Size: 8" x 5" x .245"
Note: The printed book will be slightly different than pictured as the second edition will contain some edits to both content and layout. Rest assured all of the original discussion questions will be included and the pages will remain unlined for use! This digital bundle includes both audiobook and ebook downloads of 100 Days of Discussion. The audiobook is designed to be an interactive conversation guide, complete with built-in pause indicators—between all 100 questions—to create space for discussion. The ebook is a digital PDF version of the print book with all 100 questions and unlined white space for your answers. Ebook File Type + Size: PDF, 8" x 5"
Note: The ebook will be slightly different than pictured as the second edition will contain some edits to both content and layout. Rest assured all of the original discussion questions will be included and the pages will remain unlined for use however you see fit! 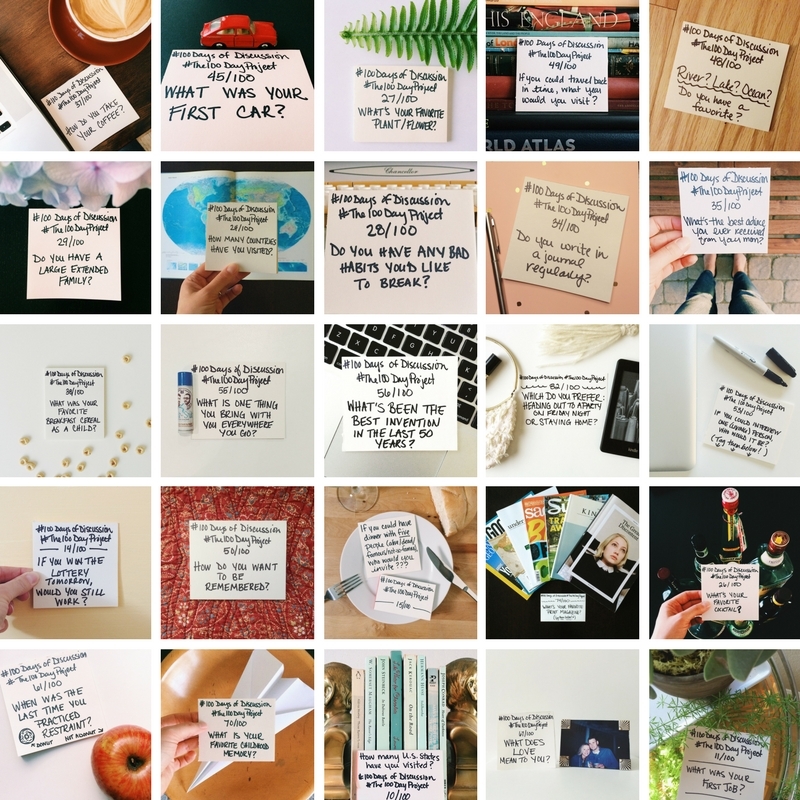 In 2015, Jennifer participated in The 100 Day Project, which was a daily Instagram initiative launched by artist Elle Luna and the team at The Great Discontent. Her specific project was called 100 Days of Discussion and each day for 100 days she posted a discussion question to Instagram after posing the same question to the man in her life at the time. The concept was based on the questions Jennifer often used to pass the time on long road trips. Because each daily question was also posted to a public platform where those who listen to the Creating Your Own Path podcast hang out, she also had the benefit of getting to know her community far better than she could have imagined. Since the project ended, people have reached out to share the ways in which they're still using the questions in their own lives. Some use the questions as writing prompts, others have pulled up the hashtag for their own road trip shenanigans, and Jennifer has even gotten word that some are using the questions to learn and teach English! Others have told Jennifer how much they cherished the first edition of the book and that they plan to share the second edition as gifts for loved ones. "It's amazing the difference a bite-sized project can make in our lives! So often change feels like it has to be BIG, but little things can make a big impact. That is exactly what 100 Days of Discussion is: one little thing to do each day that can lead to deeper relationships, profound insights, or just a little novelty and fun. I can't wait to buy my copy, I'm IN." "People who participate in 100 Day Projects either find them unsustainable, or fall into a cult-like group that finds them life changing. I fall into the latter, and my art, writing and creative work grew immensely after participating in The 100 Day Project in 2015 and 2016. What surprised me most was the camaraderie with others who were going through this project at the same time. Jennifer Snyder's project was the perfect place to bring forth a conversation with our creative community for all types of people. I remember looking forward to the thought provoking questions Jennifer asked each day. She a gifted conduit who can ask just the right question, at just the right time, and suddenly you've discovered something about yourself you never have known. For that I am grateful to have been one of the many who benefited from her amazing project!" "I was interested in 100 Days of Discussion because, while we are always connecting online and through apps, it's always very passive. The project encouraged immediate action through reflection and it made it that much easier to spark conversation with others out in the offline world. I really feel that the more people start talking about the easy, day-to-day things that we'll get that much closer to listening and understanding the heavier topics." I'VE HEARD THAT SOME OF THE BOOK PROCEEDS WILL HELP SUPPORT A CAUSE OF SOME KIND. WHAT'S THAT ABOUT? A portion of the proceeds from this book, along with future physical and digital products will help sustain the CYOP Artist Residency program. HOW SHOULD I USE THE BOOK? In the first two sections, you’ll find additional prompts as a way to encourage further discussion and reflection. The third section is full of questions that are substantial enough to stand on their own. Bottom line? This book was created to encourage meaningful discussions and greater self-awareness. THE PRINT BOOK IS SOLD OUT! WHEN WILL YOU PRINT MORE? The second edition is in the works! Those interested in being notified when the shop is updated with more print books can sign up for the book waiting list. That list is the first to know when books and other items are listed in this shop. WHY DID YOU TURN THIS INTO BOOK? The original project wrapped up in the summer of 2015 and so much has happened with Creating Your Own Path since then. In addition to hearing how others have used the prompts, Jennifer also traveled across the country to interview creatives about their work and wrote features about those with interesting careers. In those interviews, she often hears that nobody has ever asked the questions she has the honor of posing. Jennifer also watched as the 2016 U.S. presidential election made it abundantly clear that no matter how "connected" we are thanks to social media, we, as humans, don't know one another as well as we'd like to think. So, she decided to get these questions off of Instagram and into your hands. Thus, a book plan was born. Since the publication of the first edition, Jennifer and her partner for her original project — her husband at the time — split and have ultimately found better alignment through the very difficult process of divorce. Thus, the second edition will be reprinted with some updates to the story. Thankfully, our stories get to evolve and this story is no different.